Firewall Zero Hour came as a surprise at E3. Kay and I knew we wanted to check out the upcoming PSVR slate of titles, but we went into the game blind. We came away not only impressed, but so much so that it won a nomination for Best of E3 2018. Now, several months later, we finally have our opportunity to see how First Contact Entertainment’s tactical VR shooter shapes up in its final form. First and foremost, Firewall Zero Hour represents a bit of a risk, as it’s entirely multiplayer and online-only, beyond a short tutorial. The PSVR has an estimated install base of roughly 3 million, so it’s not a huge risk, but a risk nonetheless. Thankfully, it’s a risk that could pay off. 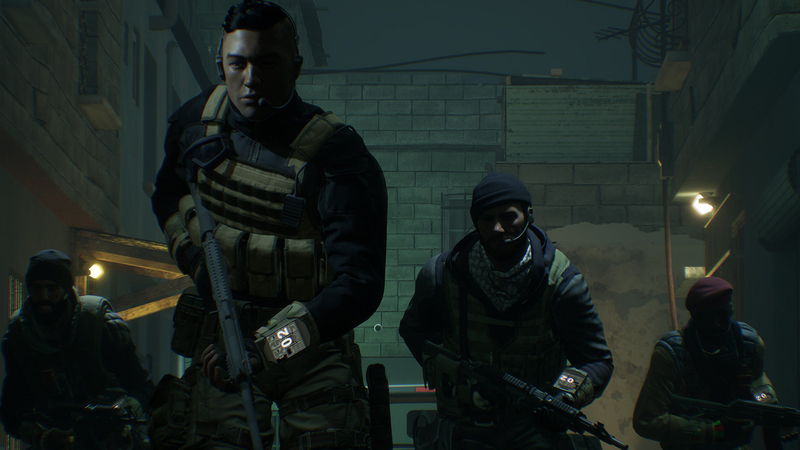 Firewall Zero Hour is split into a few areas — a single training mode, a co-op training mode, and the real star of the show, Contracts. Both of the training modes are wave-based AI-driven matches that attempt to prepare you for the real deal by acclimating you to the movement styles and mechanics of the game, though it doesn’t provide advancement of any kind. The real meat and potatoes of the game is also where the game gets its namesake. In Contracts, you and three other players will square off against another four players on the opposite team. The attacking side will have just five minutes to infiltrate the area and hack the enemy firewall. With the firewall penetrated, the attacking team can then see the true target — a laptop with secret intelligence on it. They must close in on this laptop, hack it, and steal that data. Obviously, the defending team has to stop them at all costs, either by taking out all four of the attackers, or by holding them off, successfully defending the laptop, until the clock hits zero. If you are an avid reader of the site, you know that I’m a bit of a VR junkie, owning an Oculus Rift, HTC Vive, and PSVR. I just can’t get enough of virtual reality as it fundamentally changes the way games are played, creating a new way to play tactical games. Peeking around corners, crouching, and dodging in titles like Seeking Dawn don’t require explanation as they use natural motion, and that’s precisely what First Contact is bringing to the table with Firewall Zero Hour. PC-based VR platforms have lighthouse or sensor-based systems to enable room-scale virtual reality. The PSVR uses the PlayStation 4’s camera and the colored lights on the Move controllers (or in this case, the optional PlayStation Aim Controller) to detect player position. As a result, the game is played from a stationary position, but don’t think that means that you’ll be locked in place. As long as you don’t stray more than 2-3 feet in any direction, you’ll be able to perform just about any assault motion that comes naturally. Ducking behind a cubicle, doing a quick peek around a corner, and getting agile is what this game is all about. Unfortunately, it also means that you can only do these things while facing forward — turning around causes the camera to lose track of your position. There are nine maps shipping with Firewall Zero Hour — Docks (UK), Office (UK), Shoot House (UK), Hotel (Middle East), District (Middle East), Compound (Middle East), Bunker (Russia), Warehouse (Russia), and Embassy (Russia), and I can’t say that a single one is a slouch. Every one of them has a completely stable framerate, and they are all balanced with a mix of long sightlines, tight corridors, chokepoints, enclosed stairwells, and all-too-exposed entryways. Here’s a quick video walkthru from the developers themselves that’ll give you a very short look at each of them. It would have been very easy to make Firewall Zero Hour into a CounterStrike clone where every round is a mad scramble to buy the same weapons and armor. Thankfully, the developers wanted a bit more depth than that, building in a full progression system. The Contract multiplayer mode allows you to earn experience to level up, as well as the in-game currency called “crypto”. Occasionally, you’ll even find crypto and Intel (additional XP) lying around in levels, so keep your eyes open. Leveling up unlocks access just over a dozen weapons, attachments like suppressors, extended magazines, fore grips, etc., skins for all 12 operators in the game, and a raft of cosmetics and trinkets. By level 4, you can start to craft your own operator loadouts, though it’ll be some time before you have enough items unlocked to make that useful. My first axe to grind is, well…it’d be the grind. Everything in the game costs crypto (once you’ve hit the requisite level with XP, of course), but all of the weapons, skins, accessories, and everything else costs an inordinate amount of in-game cash. To unlock your first weapon, you’ll have to win a staggering 25 matches. Couple that with my next point, and it creates a real problem. Firewall Zero Hour is an absolute blast…when you are playing. Unfortunately, this game is also an insufferable drag when you are literally standing around. After every game (note I did not say round — more on that in a moment) there is a 60 second countdown before the next game begins, whether the players are ready or not. Every multiplayer title I can think of has a mechanism for players to indicate that they are ready, bypassing the clock, but Zero Hour seems to have missed the memo. I differentiated between game and match because, despite all reasons to the contrary, Firewall Zero Hour is played as a single match with no respawns. I don’t mind the latter, but the former is a problem. When you gather eight players, it’s painful to watch a good group break up after a single game without the opportunity to modify the parameters. While you play as attackers one round and defenders the next before the game ends, it’d be nice to be able to toggle best of 3 or 5, or other modifiers to shake things up a bit. The game has been out for a few weeks now, so why is this review so late? Put simply, I was giving the game time to bake post-launch in hopes that Sony would iron out the connectivity problems. Unfortunately, this continues to be a problem, inexplicably dropping players, or the entire session, at random. It’s frustrating to finally get a team that communicates well and operates as a crew, only to watch them disband because the game couldn’t remain stable. There are two final missing options that I’d like to see added as soon as possible — the ability to mute other players, and the ability to kick them from the game. Hearing little kids shrieking, or encountering the odd racist scumbag online is a fairly common occurrence, unfortunately, and the ability to shut them up would be a welcome addition to the game. Similarly, during one play session, we ended up playing what ended up being a 3 vs. 4 game as one of our teammates was AFK for six rounds in a row. He reaped the benefits of all of our successes, having not moved a muscle. As someone who normally suffers greatly with natural motion, I’d be remiss if I didn’t mention how amazing First Contact Entertainment Inc’s implementation of movement is in the PSVR headset. Using a system that narrows your cone of vision slightly during more rapid movement, the game is a nausea free experience. If you require a little more or less comfort adjustment, those options are present in the menu, but the default was so well tuned that I never felt the need to poke at it. Firewall Zero Hour is precisely the game Sony needs for their Virtual Reality platform -- addictive, fast paced, and immersive. Unfortunately, it’s also in dire need of some tweaks to realize its potential. The grind is too deep, and the need for a “ready-up” system causes a lot of dead time between an otherwise richly rewarding tactical shooter. Patch this, and a few other minor hiccups, and Firewall Zero Hour will be the VR Rainbow Six it needs to be. PS Aim Controller feels badass! WHY is each game one round? !